In my quest to become a better chef I inevitably came across the sous vide method. This method originated from the French term for under pressure where food is placed in a vacuum sealed bag (not required to have vacuum sealed bags) and then cooked in a water bath to a certain temperature. This is the new way of many four star restaurants where 80% of the cooking is done in this method and the last 20% is done through finishing methods to give it a truly unique taste. I was very enthralled by this method and had to give it a try. I received the sous vide by chef steps as a birthday gift from my wife to help me on my culinary journey. This little gadget is incredible. It is completely controlled by your smart phone and allows you to create three star and above quality meals at home and remotely. To try and get a higher quality meal simply, I chose a recipe from the chef steps website (https://www.chefsteps.com/activities/crispy-chicken-thighs-made-simple-with-sous-vide). I chose the skin on chicken thigh because it’s a very tender and juicy piece of meat and the sweet potato purée (or mash in my case) because I love sweet potatoes. I salted and peppered my chicken thighs to taste and let them sit out for about twenty minutes. This helps to allow the salt to penetrate into the meat. This helps keep the meat juicy and gives it the taste that you expect from a high quality cook. After this twenty minutes I loaded the thighs into a bag and poured in some olive oil to cover the thighs and give it an environment to soak in while it cooks. This oil bath helps to provide the fat for the cook time to keep the chicken juicy and savory throughout the process. After this oil is added, that is barely enough to cover the thighs (with air removed from the bag), I dropped the thighs into the water bath to cook. This part is great because I am letting technology handle the rest. Meanwhile i went to work on the sweet potato purée (recipe in previous link). This was a simple recipe of just sweet potatoes, butter, salt, and water. After steaming the diced sweet potatoes for roughly 20 – 25 minutes I pulled them out and used an immersion blender to blend them up. If you have a real blender I recommend using this if you want a true purée. The immersion blender didn’t quite get the creamy texture but the taste was there so I didn’t really care. Once the chicken was done I got a non stick pan warmed up with oil and seared the chicken thighs skin side down until the fat from the skin rendered out and the skin was crispy. 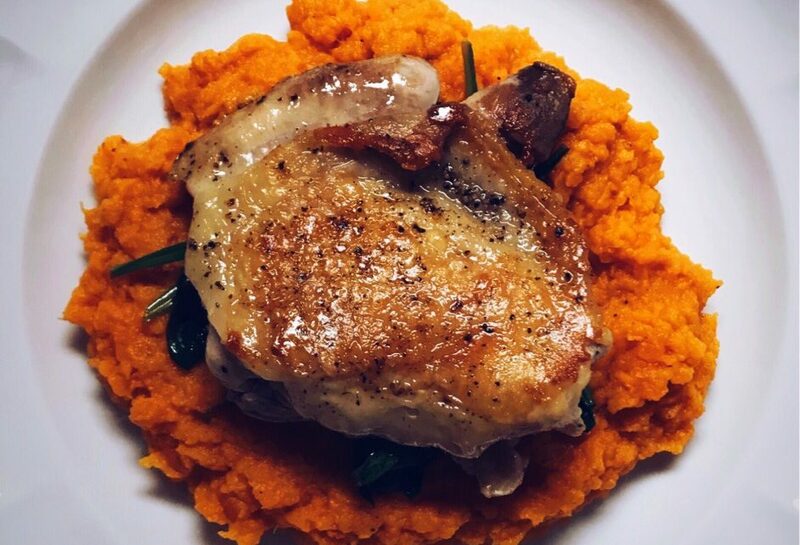 Crispy chicken thighs were then placed on top of plates of sweet potato purée and I understand why so many chefs switched to sous vide. Sous vide helps make sure that meat is cooked properly to perfection. From then it’s just browning the food to make sure it tastes good. If you have a sous vide I recommend you try this recipe. It’s a great recipe and a true test into what sous vide can create. I can’t wait to experiment more with this!